Home > Blog > What Are the CEO’s worried About? Getting the Right Skills at the Right time for the Right Purpose! So … last week I was in Miami, and did a talk on business disruption, transformation and innovation for about 30 CEO’s of companies in the healthcare, tech and IT sectors, on behalf of a private equity firm. The meeting also included a wide ranging discussion with a panel of ‘mentor’ CEO’s. This is one of several events of this type I’ve done; through the years, an increasing number of private wealth, family offices and private equity firms have brought me in for talks, including a keynote in Greece where there was about $1 trillion of value in the room. 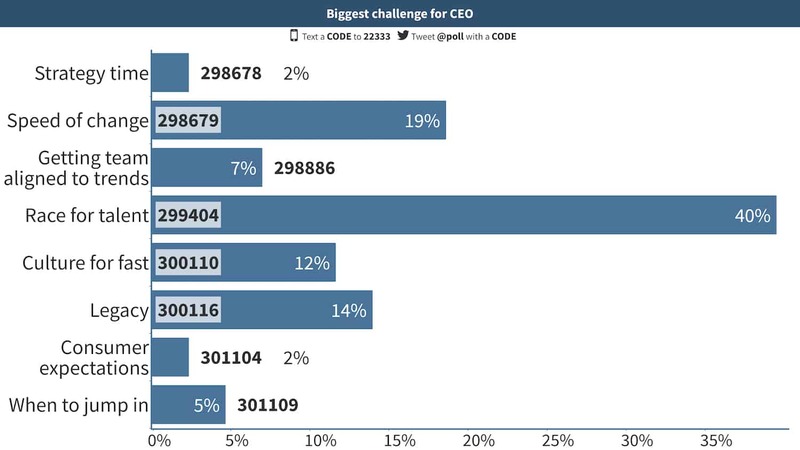 At the conclusion, I managed to query all of these CEO’s on the biggest perceived challenges they face going forward. Check out their response! Talent and skills! Speed of change! how does a CEO establish an appropriate balance between the necessity for leadership and the criticality of strategy time? Put this in the context of several recent headlines I’ve used in events : GE hiring more tech talent and purchasing startups than Silicon Valley companies; Ford hiring 27,000 computer tech staff to help it in the race for self-driving cars; and other similar issues. Clearly talent is a major issue going forward, and workforce and skills innovation is rising to the top!